The EL6851 EtherCAT Terminal is a DMX master terminal and enables connection of up to 32 devices without repeater. The DMX master terminal can send up to 512 bytes of data (this can be set via the terminal). At 250 kbit/s a maximum data rate of 44 kHz is therefore possible. The RS485 interface in the EL6851 is electrically isolated and guarantees high interference immunity. In addition, the RDM (Remote Device Management) protocol can be run via the EL6851. RDM is an extension of the DMX protocol and enables addressing and parameterisation of devices. TwinCAT offers associated libraries. 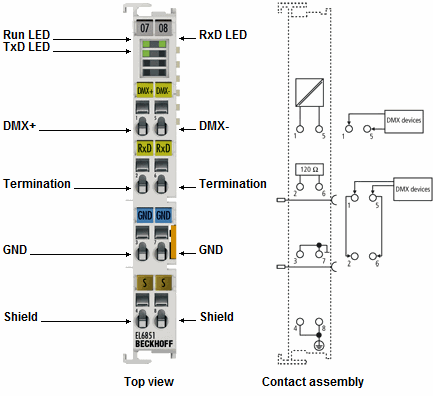 The EL6851-0010 EtherCAT Terminal is a DMX slave terminal. The DMX slave terminal can receive up to 512 bytes of data. The start address and the data length can be set via the CoE (CAN application protocol over EtherCAT) objects. The RS485 interface in the EL6851-0010 is electrically isolated and guarantees high interference immunity. The DMX slave receives data from a DMX master and transmits them to the application via EtherCAT. In this way, non-DMX-capable devices, like DALI lamps or dimmer terminals, can also be addressed. DMX is based on RS485 physics. An integrated termination resistor can be connected through two-wire jumpers in the terminal.